Tinkering is more than just making things. It’s experimenting, letting your creativity loose, letting yourself fail and learning from the experience. Tinkering is a way of expanding your mind and your conceptions about what can be done, and more importantly, what you can do. If something isn’t quite right, fix it! If what you need doesn’t exist, invent it! Tinkering is about gaining the confidence to be an active participant of the world, and to shape the future. Tinkering is a skill that children can develop and practice throughout their lives. There are some easy ways to get them started. That’s what this series is about. Building at a kids’ makerspace like reDiscover Center is beneficial: makerspaces have tools and materials that you may not have at home, they provide experienced facilitators to help a child become a creative, efficient, safe and independent maker. Makerspaces are also a great place to interact with other makers, to give kids the opportunity to work together, develop teamwork skills, and make something bigger than they could on their own. Makerspaces are also easier to clean than your living room. But, much to the chagrin of some of our tinkerers, you can’t live at reDiscover Center. It’s important to have the essentials available when inspiration strikes. Kids spend more time at home than school and activities combined, particularly unscheduled time that is is conducive to making and tinkering. We want all kids to have agency in their activities, to make things that matter to them and that will help them in their lives. 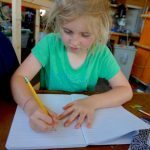 This series will cover not only some specific activities that you can do with your kids (or let them do on their own), but go into the philosophy of maker education, so you can be better equipped to help your children grow as independent makers. I hope you join us on this journey! If you have photos or stories of tinkering at home that you’d like to share, please let us know.